Apple notebooks out in force at Microsoft's Mobius 2009 conference. The photograph accompanying a report posted by Jason Dunn in "Windows Phone Talk" entitled "Mobius 2009: Fascinating, but Little That Can Be Shared" is kind of fascinating in its own right, given that it was taken at an invite-only event, hosted by Microsoft. "Out of the 25 attendees, 13 of them were using OS X. The other 12 were using Windows. Interestingly, many of the Windows users were from Europe or Asia; the vast majority of the OS X users were from the USA. This is the only place on the planet where OS X has 53% market share." "There's been growing murmur for a couple years now and it's all about how the world's favorite open-source browser is slowing down people's computers, especially ultraportables and netbooks. Call it malaise or whatever you like, but Firefox is noticeably less nimble than it used to be. Why and what can we do about it? "Mozilla has published a support document entitled Firefox consumes a lot of CPU resources (see also: Firefox CPU usage (mozillaZine KB), via News.com), which describes in detail the causes and potential remedies for this browser's resource rapacious ways. In a nutshell, if your MacBook, MacBook Air or hackintoshed netbook's fan kicks on every time you view media-rich Web pages in Firefox, now you know why. "Here are the Top 3 culprits and steps you can take...."
DigiTimes' Max Wang and Joseph Tsai report that according to their sources at far East component makers, Apple plans to postpone the launch of its tablet computer from an originally pencilled-in March launch to the second half of 2010, due to having decided to switch some components and new plans to launch a model using a 9.7" OLED panel from LG Display. It's now expected that there will be be two Apple tablets: one with a 10.6" TFT LCD display, and the other with the significantly pricier 9.7" OLED, the article noting that LG Display's five-year, US$500 million, panel purchasing contract with Apple includes supply of OLED panels, going on to observe that since 9.7" OLED panels are currently priced at about $500 and since display costs normally account for about 30% of a device's total cost, Apple's 9.7" OLED tablet model could be expected to sell for about $1,500 to $1,700 based on today's prices, but adds that with OLED panel prices dropping rapidly and expected to reach an acceptable level for notebook products by 2011, Apple's delayed tablet introduction may be partly predicated on anticipated OLED price reductions to a range of around $1,200 to $1,500 by the second half of 2010, also noting that the price could be considerably lower if the Apple tablet is sold bundled with a telecom provider's 3G services, and that the 10.6" LCD panel-based Apple tablet model is expected to priced in the $800 to $1,000 range. AppleInsider Staff reports that in a note to investors released Thursday morning, Piper Jaffray analyst Gene Munster says that it will be "irrelevant" to Apple's stock price if long-rumored tablet actually is delayed until the second half of 2010, since current Wall Street pricing models have not yet factored-in sales of the rumored device. Munster says that "investors' focus is more on whether the tablet is real and less on timing, but notes that Piper Jaffray analysts met with component suppliers this past summer who also suggested the tablet would be launched in early 2010. That corresponds with AppleInsider's own sources, who said the hardware will arrive in the first quarter of 2010. Munster dismisses DigiTimes' assertion Thursday (see item immediately above) that a high-end tablet with an OLED screen could retail for as much as $2,000, believing the the strategy is for the tablet to slot price-wise between the $199 iPod touch and the $999 MacBook, says Piper Jaffray maintains its forecast that the Apple tablet will sell for between $500 and $700. "It's widely accepted that Microsoft have done a fairly good job with Windows 7, managing to overcome many of the problems associated with Vista. Although I'm a content Mac user, I'm the first to accept that there are circumstances where it would be great to run a copy of Windows on my machine. Whether it's for playing a little Modern Warfare 2, testing a website in Internet Explorer, or just experimenting with the latest Microsoft have to offer. "Today I'll be looking at four different ways you can quickly and easily set up a working copy of Windows 7 on your Mac. "Everyone knows what happened update 10.6.2. As well all know that Intel Atom is not supported by the new kernel. Well, let's wait when http://opensource.apple.com will source xnu. While there is no source, I made a patch for mach_kernel10.2.0. This "dirtybithack", so claims are not accepted. The patch is designed exclusively for Atom-based netbook! "I do not update the working system to version 10.6.2, all the field tests carried out on what was at hand, namely, the unfolded stick to Mac OS X Snow Leopard Server. The installer is loaded with a patched kernel. "If someone uses the kernel and updated from previous versions of Mac OS, test the given kernel and otpishites in the comments, I'll be very grateful." DiscoveryChannel.ca's Haig Balian says that Microsoft's Windows 7 means there are now two mainstream operating systems you can recommend to your computer-challenged aunt (along with Apple's Mac OS X), but that recommending the "best" laptop is a hard ask - what's perfectly adequate for one be woefully insufficient to another. Summarizing, Balian says that if you want the laptop mostly for home use - playing music, watching movies, viewing and editing photos, surfing the Internet, word processing, etc., at the top of his "can't miss" options is the 13" MacBook Pro, which "there's a lot to love about" - first and foremost its beautiful design, noting that If you're a switcher to Mac from Windows, as he was, it may take a little time to acclimatize to the new interface, but once you do, you'll be delighted, and that while you'll be paying a premium price starting at C$1,300, in his view, it's totally worth it. "Let's get one thing straight from the off. When will Apple make up its mind about FireWire? Originally supported across the entire Mac range, when it was dropped from the 13-inch aluminium unibody MacBook in late 2008 . . . The next revision of Apple's laptop range saw the aluminium MacBook join the Pro range, and much to the relief of the Apple faithful, FireWire was restored. Yet now, with the release of this new entry-level white polycarbonate 13-inch MacBook, the FireWire port has disappeared again. 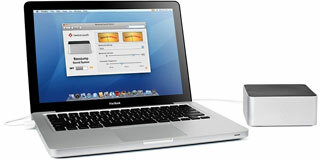 "Thankfully, most of the new MacBook's revisions are far more welcome than its dropping FireWire support. Several popular features introduced for the MacBook Pro range are now finding their way onto Apple's entry-level laptop...."
"The new MacBook isn't metal, but it does in many respects improve on the sometimes problematical case design of its predecessor - which is the best-selling Apple portable ever. Unfortunately, however, it is a disappointment in certain other respects, notably Apple's evidence continued determination to eliminate FireWire. It's kind of a case of Apple giving with one hand by restoring FireWire to the aluminum 13 inch MacBook Pro back in June, and not taking it away with the other by removing the entry-level MacBook's FireWire port. There are other shortcomings as well, that I will get to in a moment." CreativeMac's Heath McKnight says Apple's flagship MacBook Pro does not disappoint. McKnight recently had a chance to review the latest, top-of-the-line unibody MacBook Pro from Apple; with a 3.06 GHz Intel Core 2 Duo processor, 8 GB of RAM, a 500 GB hard drive, and many other great features, and observes that this is the fastest Apple laptop he's ever used. Apple currently has several beyond-warranty extended repair programs in play for notebook computers. If you think your computer might be covered under these programs, check the serial number against those cited below. Distorted or scrambled video on the computer screen or no video on the computer screen (or external display) even though the computer is on. Fortune's Michael V. Copeland says that a few years ago rivals mocked Jonney Shih, chairman of Asustek, for his purse-size laptop computers, but millions of netbooks later, Shih is having the last laugh. According to the report, Shih is the largest shareholder and chairman of Asustek, the $21-billion-a-year tech conglomerate started in 1989 by four former Acer engineers, and the company that launched the netbook phenomenon three years ago, revolutionizing the stagnant PC industry. Asustek (Asus for short) went on to sell millions of mini-notebooks and soon vaulted to No. 5 in worldwide PC market share. Today virtually every PC manufacturer on the planet offers netbooks - the notable exception being Apple. PR: Imation Corp. has announced availability of its next-generation Solid State Drive (SSD) Upgrade Kit, simplifying migration from a Hard Disk Drive (HDD) to SSD in just three easy steps for the road warrior, laptop aficionado or home user wanting to get the most out of their systems. Unlike other SSDs on the market, Imation's SSD Upgrade Kit provides a specially designed case that enables users to repurpose an existing drive and turn it into an external USB drive for additional storage, further leveraging their hardware investment. 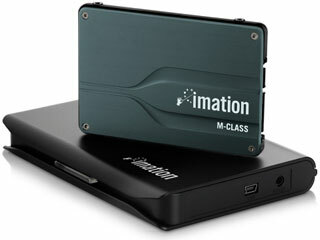 Designed based on its award-winning predecessor, Imation's 2.5" M-Class SSD Upgrade Kit includes an all-in-one solution that offers a performance-enhancing solid state drive replacement for a traditional spinning hard disk drive. Convert: unique design with a SATA-USB bonus case repurposes the existing hard drive into an external, yet portable USB drive for additional backup and storage. Imation's M-Class SSDs use sophisticated error detection and correction techniques. Unlike other SSDs that typically use up to 10 bits of Error Correction Code (ECC) in 512 user bytes for the detection and correction of corrupted data, Imation includes a 20 percent boost in its M-Class SSD and uses 48 bits in 2k user bytes to guarantee extreme data reliability, while still showing increases in application speed and boot times - something the user experiences every day. Boost in sequential read and write performance is to 230 MB/second and 170 MB/second, respectively. In addition, Imation M-Class SSDs now utilize the most recent advances in Global Wear Leveling to uniformly distribute P/E (Program/Erase) cycles across all cells in the SSD, increasing overall endurance of the drives. Sophisticated algorithms are employed to manage any bad blocks that might develop over time and replace with spare blocks as needed. Through stringent testing, Imation confirmed the improved drives are able to withstand continuous writing to the drive with spare blocks still remaining after 10,000 P/E cycles. Each Imation M-Class SSD also now comes with an extended five-year warranty. The new 2.5 M-Class SSD Upgrade Kit provides an all-in-one cable-free and universal solution. No additional power brick is required, generating less waste. Underscoring the product s intuitive design is an easy-to-use hinge case with LED-indicator for in-use identification and, unlike any other product on the market, a unique case enables the user to convert the remaining hard drive into a portable USB external drive. "With our improved M-Class SSD Upgrade Kit, only Imation has provided users with an unique case and method to upgrade to SSD and convert the remaining HDD drive into a portable USB drive, while taking full advantage of the benefits inherent in solid state technology," says Subodh Kulkarni, senior vice president, global commercial business, Imation. "We have simplified the migration path for all those who wish to get the most out of their systems using SSD." Imation also announced today its Pro WX Wireless USB hard drive (see item above). The M-Class SSD Upgrade Kit is available in a 2.5" form factor in capacities of 64 GB and 128 GB. Products are available for a starting MSRP of $110.99 for the M-Class drive and $194.99 for the M-Class Upgrade Kit through authorized Imation distributors, wholesalers, resellers and e-tailers in the U.S. and Europe. PR: Designed exclusively for MacBook, BassJump is a sweet, one-of-a-kind, go anywhere, USB-powered subwoofer that turns your MacBook into a mini sound system. One single USB cable delivers power and sound. Custom software blends the music coming out of your built-in speakers with the sound output of the BassJump for dramatically enhanced audio performance. BassJump makes those great sounding, built-in MacBook speakers sound even better by adding mid- and low-frequencies through one well-designed, travel-sized subwoofer. It's a smart, simple way to dramatically improve the sound of your MacBook without cluttering up your workspace with a clunky set of replacement speakers and cables. Once the BassJump software is installed, simply connect one single USB cable, launch iTunes and enjoy the new and improved sound of your MacBook, MacBook Pro or MacBook Air. Software you can see and hear. BassJump software combines audio coming from your MacBook speakers with the low frequency bass coming from the BassJump subwoofer. By blending to two audio sources, you hear a dramatically richer, fuller sound. iTunes will sound better, and so will your favorite games. And wait till you see the BassJump preferences window. Two big, glowing, old-school style analog VU meters add a bonus visual experience to your sweeter sound. There's even a cool little VU meter in the preferences bar. The BassJump preferences window also lets you to customize the sound to suit your style of music: rock, pop, R&B, etc. One software download. One USB cable. One volume control. You get the idea. BassJump makes it easy to better your MacBook listening experience. Once the software is installed, it's pretty much plug and play. Just in case you forget what your MacBook sounds like without BassJump, you'll find a big on/off switch. Use it to hear how much better your MacBook sounds with this bass boosting bundle of joy. Just like your MacBook, BassJump is completely portable. Take it to work. Pack it when you travel. Carry to a friend's place. Because it's USB powered, there's no need to carry extra cables, adapters or power cords. Just slip BassJump into the included neoprene travel case and you are ready to go, near or far. Minimum System Requirements: Mac OS 10.5.8 or later.